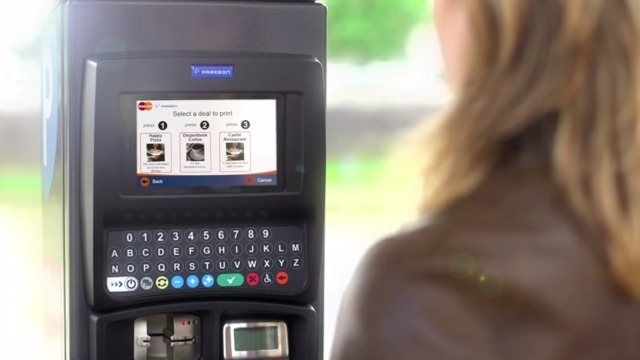 MasterCard and Parkeon have launched City Connector, a couponing platform that delivers offers and services from local businesses via on-street parking meters. The first location is in downtown Las Vegas’ Container Park on Fremont Street. Sixteen interactive kiosks went live June 30 with offers from at least 20 stores and restaurants within Container Park. Powered by the Enterprise Offers Platform from MasterCard, traditional parking meters turn into connected devices to engage consumers, providing cities with another way to connect local businesses with citizens and visitors. The solution allows third parties to publish offers, manage campaigns and specify targeting criteria, enabling more relevant and more customized experience for consumers around the globe. No registration or sign-up is needed for City Connector. People can park their car or walk by and scroll through offers local businesses are displaying on the parking meters. Customers can select any deals using the kiosks’ interactive screens, after which the relevant coupons are immediately printed. These coupons can then be redeemed at point of sale when visiting the merchant. City Connector debuted at the International Parking Institute annual conference in Las Vegas June 29 – July 2. Cox Business/Hospitality Network has completed the deployment of Wi-Fi technology at nearly 1,500 guest rooms and convention space at Tropicana Las Vegas. The upgraded Internet access at Tropicana satisfies increasing user demand for mobility and results in a substantial leap in bandwidth availability for room guests and delegates to the convention area. Users will be able to stream high-definition video and download large business presentations, use cloud applications and send/receive large files or photos and other digital data at high speed. With the rollout of upgraded infrastructure based partly on the DOCSIS 3.0 modem standard and 802.11AC Wi-Fi access points, Tropicana is now among the Strip resorts providing top-tier Internet services. Cox Business/Hospitality Network and Tropicana Las Vegas have had a business relationship since 1995. Las Vegas ranked number one on the list of the fastest-growing cities for technology events, according to a survey by Eventbrite. The global marketplace for live experiences closely examined nearly 70,000 tech-focused events and surveyed more than 3,000 attendees of tech classes, workshops, seminars and conferences to find out who’s attending tech events and why. The report, “Keeping up with the Coders: Surprising findings in the who, what, and where of today’s booming tech events,” found that techies aren’t the only ones attending. According to the survey, 60 percent of event attendees do not work in technology. Though IT was the top industry represented in the survey, marketing and sales professionals were not far behind, as were entrepreneurs, educators, and managers. The survey revealed that 86 percent of the technology events had programming intended to help attendees learn about tech topics. More than two-thirds were in the format of a class, workshop, or included a featured speaker. The remaining portions were classified as conferences, or networking events hosted by hobby and professional groups. When asked about their motivations for attending tech events, more than half of the responders said they were building on skills that are needed in their current jobs.